Flex-Metal® was invented and patented by Arnold Cook, Ironwear®’s founder. Arnold Cook was an advanced material development contractor for NASA and was developing metal matrix composites for aerospace applications. In 1995 Arnold Cook sold his advanced materials company to PPC (who was recently acquired by Warren Buffett, Berkshire Hathaway Inc.) and started Ironwear@ to develop the applications of Flex-Metal®. Flex-Metal® is a composite material consisting of atomized high iron suspended in a flexible polymer matrix. Ironwear® produces it own proprietary thermoplastic elastomers and compounds its own injection moldable composite materials. Flex-Metal® is non-toxic and is made of food grade base materials. Flex-Metal® is compounded to be the same durometer (softness) as human skin. This allows weights made of Flex-Metal® to easily move, bend and conform to the shape of the wearer. Because of their properties Flex-Metal® weights they are much safer to use than any other type of weights. Flex-Metal@ weights can be evenly spread out on the body and not interfere with a persons movements. They are safe for use in all types of activities and for people of all ages. Flex-Metal® weights protect the wearer as well as everything and everyone around them. They can be used in activities were the user may come in contact with other people such a training on the field, ice or in the gym. 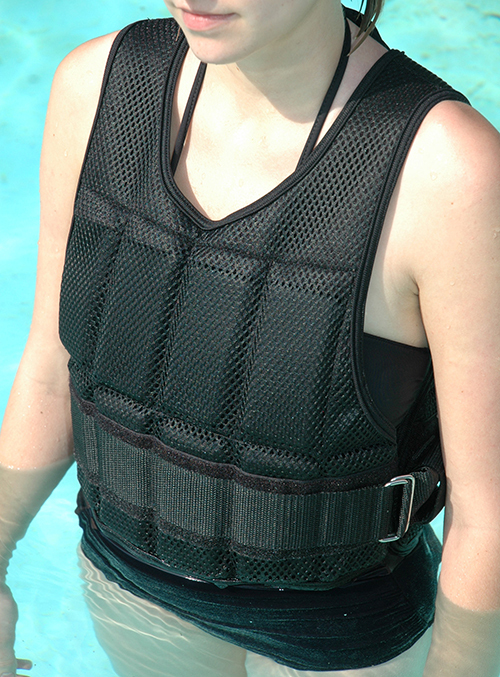 Each Flex-metal® weight insert is covered by a protective swim suit fabric shell. The shell protects the soft rubber weights and allows the weights to slide easily into the pockets. Flex-metal® weights can also be used in the water. A high chlorine environment such as swimming pools may cause some rust to form on the outside of the weight under the shell, but as long as the weights can dry after use, the oxidized layer should not cause any problems. Ironwear Flex-metal® weight inserts are 1/2 x 2 x 4 1/2 inches inside and fit into all adjustable weights pockets in Ironwear® Vests, Ironwear® Pants, Ironwear® Hand Weights, Ironwear® Wrist and Ankle Weights, Ironwear® Shoe Weights, Ironwear® Head Gear as well as Ironwear® Blankets. Ironwear® produces all of its weights in Pittsburgh using recycled steel to make high purity atomized iron, and because of the high volume of iron in the weights, a magnet will always stick to an Ironwear Flex-metal® weight. Ironwear® weights contain no lead. Due to lead's toxic properties, it is not allowed in Ironwear® plants. Ironwear Flex-metal® weights bought from Ironwear have a lifetime guaranty against material and/or workmanship failure. We challenge you to find better weights.